Florianus II is a stallion with an incredible work ethic. He has very supple gaits with a lot of flexibility and scope in his movement, and he excels at the collected work. He also represents the hallmark of ISF stallions—athletic talent coupled with an incredible temperament. 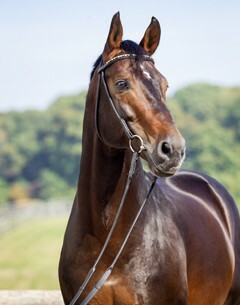 Florianus II successfully participated at the 2003 Bundeschampionat in Warendorf, as well as the 2004 World Championships for young dressage horses. His willingness to collect in the most difficult movements of passage and piaffe demonstrated his trainability and athleticism; this was rewarded in 2006 by numerous ribbons in Grand Prix. 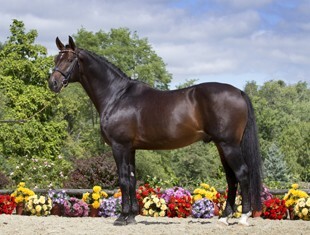 He was the most successful Westfalen in Germany in 2007, collecting 22,000 euros in prize money. After his importation to the USA, he continued his winning ways and finished first in numerous Grand Prix classes throughout the East Coast. Due to his busy show career, Florianus II has only been bred on a limited basis, but the resulting foals are exceptional - both in their personalities and their movement. 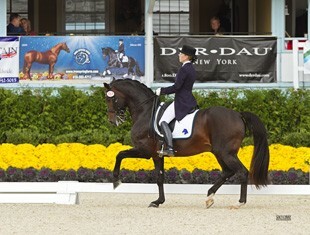 At the 2011 and 2012 Dressage at Devon Breed Show, Florianus II won the prestigious Get of Sire class. In 2012, his son, For Set, was Approved Westfalen, and daughter Florencia B is now winning at the CDIs in Europe.